Robert Jenkins uses his unique point of view, quick wit, and disarming delivery to tell you why he's right. You'll disagree, but you'll laugh anyway. A Detroit native, Rob has performed at many festivals including the Oddball Comedy & Curiosity Festival, Bridgetown Comedy Festival, and Laughfest where he was a 2016 participant in the Best of the Midwest Comedy Competition. 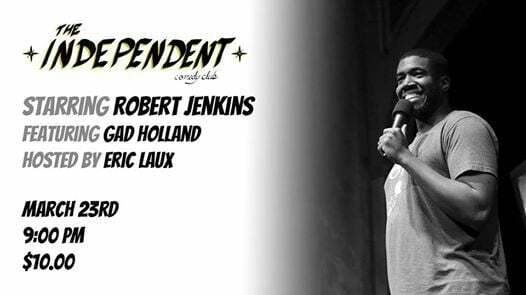 Rob has appeared on the Fox Stand-Up Comedy Show “Laughs” and appeared in Dave Landau’s Detroit-based comedy “The King.” Rob has opened for Hannibal Buress, Kyle Kinane, Matt Broussard, Alonzo Bodden, Red Grant, and many others. In 2015, Rob released his first comedy CD "Achievement Unlocked" - it's available on iTunes, Amazon, Xbox Music, and many other places.